It fails to show solidarity with the democratic struggle of Syrians, that lives on through the protests and the local councils, which despite the regime's constant aerial bombardment, continue their attempts to construct a new, democratic society in parts of Syria liberated from the regime's control. The lack of support from left-wing activists for these grassroots democratic initiatives – persisting despite unimaginable violence – will be eternally regretted unless altered. The struggle in Syria is a continuation of the uprising that began in 2011. Although subject to numerous defeats and setbacks, the spirit of the revolt is maintained in the Friday protests which still take place during the breaks in the fighting. Much of the popular organisation that drove the revolutionary movement however has been destroyed through the regime’s unrelenting violence, and the authoritarian structures and repression created by certain parts of the rebel armed groups. The revolt created many local councils, which despite the constant aerial bombardment of the regime are attempting to construct a new democratic society in parts of Syria liberated from the regime’s control. The key to rebuilding Syria as a democratic and free society lies in strengthening Syrian civil society and the democratic organisations created by Syrians during the course of the revolt. Socialists who oppose any military intervention should be focusing their efforts on this, at the very least. While it is true that it's not just the Assad regime and its backers that have committed atrocities, the regime and its backers are responsible for the overwhelming majority of civilian casualties in Syria. It also currently has as many as 200,000 people locked up in detention facilities across the country. This has been documented at length by Syrian human rights organisations, primarily the Syrian Network for Human Rights, and the Violations Documentation Centre. Both organisations record killings and abuses by all participants in the conflict. No other actor in Syria, even ISIS, comes close to the level of barbarity inflicted by the Assad regime. It is not the armed struggle that was responsible for the intervention of other powers, but the Assad regime itself. As the regime has neared defeat on several occasions it has sought backing from regional and international powers to preserve its rule. First, it involved Hezbollah clandestinely in 2012 to prevent the fall of Damascus to the Free Syrian Army (FSA) units that surrounded it. Then, it openly utilised both Hezbollah and the Iranian Revolutionary Guard Corps (IRGC) in 2013 to turn the tide against the armed rebellion. The Assad regime welcomed the US and Saudi intervention against ISIS in 2014 which granted the regime breathing space, and a break from fighting on multiple fronts. And finally, there is the Russian intervention in 2015 to prevent the regimes fall when the armed rebellion was again gaining the upper hand. In addition, Bush mentions the rise of ISIS. While their growth in Iraq can be clearly linked to US policy and the sectarian, anti-democratic behaviour of the Iraqi government, he fails to specify the causes of its rise in Syria, despite alluding to regional actors that support or tolerate them. The actor that most clearly tolerates and supports ISIS is the Assad regime. ISIS’s foothold in Syria was prepared and facilitated by the Assad regime systematically targeting all other opposition factions except ISIS, allowing them to grow in strength at the expense of the FSA and Syrian Islamic factions. The Assad regime has a working relationship with ISIS, providing technical staff to maintain the powerplants it controls that provide regime areas with electricity. Several regime businessmen have been shown to act as go-betweens, facilitating oil deals between ISIS and the regime. And the regime draws its raison d’etre from ISIS's continued existence, and thus has little interest in defeating the group. Even as pro-regime forces recaptured Aleppo, they allowed Palmyra, recaptured in 2015 to much fanfare, to fall once again to ISIS. Any analysis that fails to examine this relationship cannot properly understand the dynamics of the conflict. Bush states that each side has been producing propaganda that makes it hard to discern the truth of claims. He claims reporting on the ground has been spotty at best and that social media has not elevated the voice of regular people. This claim erases from view the vast and heroic work done by Syrian citizen journalists and the brave western reporters who have travelled to and reported from rebel-controlled Syria. None of the work of Hadi Al-Abdullah, Raed Al Fares, Zaina Erhaim, Razan Ghazzawi, Rami Jarrah, Dani Qappani, Kassem Eid, Lina AlShamy, Monther Etaky, and many others, is referred to by Bush. This approach reproduces the central error of much Syria “analysis” by Western activists: the total erasure of any actual Syrians from said “analysis”, rendering its conclusions largely useless to the task of truly understanding Syria. Every town and village in Syria has produced media activists and media centres that report on the situation via websites, Facebook or Twitter. The conflict is one of the most well documented in history, with hundreds of thousands of YouTube videos recording many of the atrocities inflicted by government forces on the populace. There are hundreds of hours of videos of barrel bombs and shells falling on civilian areas, and films of the rescue efforts carried out by the White Helmets. A large part of the regime narrative has been aimed at spreading scepticism and disbelief about these reports, something also reproduced in much leftist analysis, which seems to regard the output of citizen journalists on the ground as no more reliable than that produced by the Syrian regime itself. The argument that we need diligent research and sober reflection implies that this is not being done, that there aren’t already organisations undertaking this work, when in fact there are plenty. From the aforementioned Syrian human rights groups, organisations like the Syria Justice and Accountability Centre and the Syrian Freedom Charter, through crowd sourced research centres like bellingcat, to the more traditional policy think tanks, as well as theoretical journals like Al Jumhuriya, plenty of organisations have devoted serious time and effort to understanding what is happening in Syria. That much of the Left probably discounts this output as propaganda has more to do with them disagreeing with its conclusions, than them having undertaken a serious critique of its methods and evidence. The debate about strategy may be taking place in the abstract for some, as the left has largely excluded Syrians from the debate. For those actively engaged in the solidarity movement, strategy is concrete: there are civil society projects and democratic local councils to support with materials and awareness raising campaigns; there are schools, refugee camps and hospitals to raise funds and political support for; there are Syrian revolutionary activists and theorists whose voices we can amplify and provide platforms for; there are state actors which are responsive to public pressure which we can protest against; and there is the policy of the Western imperial powers which we can seek to influence to ensure they give more support to the remaining democratic and nationalist forces, and do not abandon them further. Syrians understand this and have been doing it, with differing levels of success, largely alone as the left absented themselves from the struggle. * In August 2012 film maker Orwa Nyrabia was arrested by the Assad regime. Filmmakers and actors internationally lobbied for his release, launching a high profile international campaign in his support. The Assad regime released him within a few weeks. * In 2014, as the regime’s starvation sieges were enforced on the suburbs of Damascus, media activist and resident of Moadamiyeh, Kassem Eid (then going by the pseudonym Qusai Zakaryia) launched a hunger strike in protest. This grew in to an international solidarity hunger strike involving political activists, public figures, artists and elected officials worldwide. The Assad regime, fearful of the negative publicity that was developing, made a deal allowing aid to enter Moadamiyeh, and eventually removed Kassem from Moadamiyeh to bring an end to his campaign. * In December 2015, an international media campaign started by Syrian activists to raise awareness about starvation in the town of Madaya forced the regime and Hezbollah to allow aid into the besieged town. Syrians themselves initiated all of these actions. How much more effective would these actions have been had they been actively supported by anti-war organisations and left-wing campaign groups worldwide? Why, when Syrians trapped and besieged in dire conditions were showing how non-violent resistance and media campaigns could change the situation, was the left so unwilling to engage with their struggle and support them? This abandonment has allowed the regime and its backers to commit ever-worsening atrocities, safe in the knowledge that it faces little in the way of public opposition from anti-war or socialist organisations. This in turn has fed the sense of abandonment and isolation faced by Syrians, feeding the narrative of extremist groups that they have been abandoned by the world and that no one supports save for sectarian jihadist organisations. In 2003, active opposition to the US war on Iraq extended across all countries, even when their own governments were already officially opposed to the US invasion (French and German governments both opposed the war, yet both countries saw significant popular mobilisations against the war). Why should socialists limit themselves when opposing Russia’s intervention because their own government also opposes it? This approach grants a free pass to Russian imperialism, safe in the knowledge it faces none of the public opposition that the US faces, and further adds to the isolation and abandonment of Syrians struggling against the Russian occupation of their country. Finally on Britain’s anti-war movement; this is not an accurate picture at all. The anti-war movement is a shadow of its former self. The protests in 2015 against Britain’s involvement in Syria numbered only a few thousand in central London. And the anti-war movements policy towards Syrian activists has been shameful. 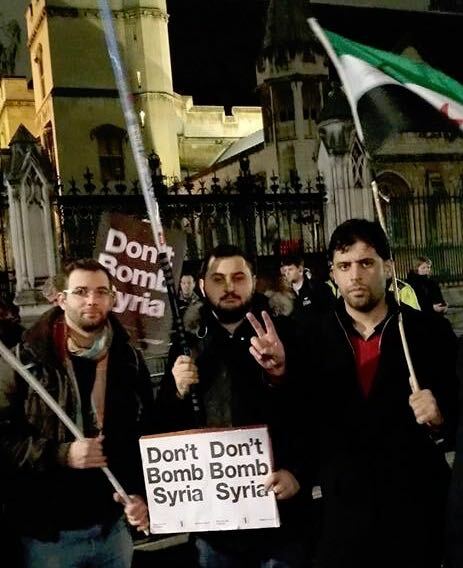 Stop The War Coalition (STWC) attempted to exclude revolutionary Syrian activists from participating in the demonstrations against bombing Syria, trying to eject them from the march and take their revolutionary flags from them. This was the culmination of years of isolation and denigration of Syrian activists by the STWC. In 2013 they invited an Assad regime apologist, “Mother Agnes” to address their national conference, and only withdrew her invitation after protests from Syrians and other speakers. Despite repeated appeals from Syrian activists they have not supported the Syrian revolution, and for several years actively prevented pro-Revolution Syrians from speaking at their meetings. Only after repeated and vigorous protests and campaigns in the national press did local anti-war groups begin to invite Syrian activists to speak, beginning in 2015 – more than four years after the outbreak of the revolution, and well past the time when consistent and active solidarity could have significantly changed the course of events. As of the time of writing, STWC still has not hosted a pro-Revolution Syrian activist at any of its national meetings. STWC's stance on Syria has had a marked effect, losing it much support among Britain's Muslim population who can more readily see its hypocrisy. British anti-war rallies have become increasingly dominated by older, whiter crowds, and conspiracy theorists who refuse to accept that any enemy of the West is as worthy of condemnation as the US, thus allowing Syrian, Russian and Iranian war crimes to continue without opposition from this segment of the left. Left and socialist activists have a choice: they can acknowledge the serious failings of the left over Syria, and seek to make amends by working to provide active solidarity to the remaining democratic and nationalist forces still struggling for the original goals of the revolution; or they can continue to abstain from the struggle, and the situation in Syria will continue to deteriorate and drag the entire world further in to the abyss. The starting point of our approach must be solidarity with Syrians struggling against the Assad regime and Russian and Iranian occupation. Simple demands that should be able to unite most sections of the left are: for an immediate ceasefire in Syria, for humanitarian aid to all besieged areas and an end to the forced evacuations of opposition areas as we have seen inflicted on Aleppo, Moadamiyeh and Darayya. Socialists should campaign for the release of the 200,000 detainees and aim to make this a central part of any ceasefire or peace deal between the regime and rebel groups, alongside calling for the withdrawal of all foreign occupation troops from Syria (primarily Russian, Iranian, Lebanese, Iraqi, but also Turkish), and the removal of the Assad clique from power. These points are in line with those developed by the Save Our Syria coalition of Syrian NGOS, activists and human rights organisations. Their three demands are for protection of civilians, breaking the sieges, and justice and accountability through the prosecution of war criminals. All of these actions can be undertaken without having to advocate for military intervention. However, any approach that does not include the removal of Assad guarantees the continuation of the war, as it is Assad's continued rule that is driving the armed conflict. There can be no peace, justice or reconciliation in Syria while Assad remains in power; the left must acknowledge this and work towards his removal, or Syria and the region will face decades of war. Syria Solidarity UK has produced a Syrian Revolution Resource page with links to news sites, documentaries and films about the revolution.